Review Fix chats with Davenport Cabinet guitarist and vocalist Travis Stever, who discusses the band’s newest album, “Damned Renegades.” Steever, who is also the lead guitarist for Coheed and Cambria, breaks down the band’s creative process, goals for the future and how their newest album is a different endeavor than their previous work. Review Fix: How was the overall reception to the original EP? Travis Stever: The reception to the “Risks in Magic” EP was overwhelmingly awesome. It was the first time Davenport Cabinet had worked as a band as opposed to just Tyler and I. And the fact that it was so well received was exciting. Review Fix: Did that reception play a role in this album? Stever: Absolutely. It made us more ambitious and eager to experiment and stretch out sonically. There were numerous ideas already there and the positive reinforcement just made us more driven. Review Fix: How is this album different than your previous work as a group? Stever: The first record “Nostalgia in Stereo” was more of a lone venture aside from Rory Hohenberger playing drums. Then the next record “Our Machine” Tyler Klose my cousin and an ultra talented singer songwriter joined on with me sharing guitar and vocal duties. Aside from Rory playing drums on some songs and some other guest appearances by friends I played all the other instruments. “Risks in Magic” was the first full band release. With Tom Farkas on bass and Michael Robert Hickey on drums. As I said before it went so well we set out to make a full length. And it finally brought to life the full band sound I always wanted with Davenport Cabinet. Review Fix: What was the creative process behind “Everyone Surrounding”? How was the song written? Is there a story behind it? Stever: With Everyone Surrounding I had a bunch of guitar riffs and I basically arranged them into a song format. I originally had it all done on acoustic. Fully recorded. I had sent it to Claudio a while back to see if he had any interest in making it something for Coheed. He immediately felt like it was something more fit for Davenport Cabinet. I had vocal ideas but wasn’t as happy with them. So I sent it to Tyler and he was ultra excited. He basically came up with vocal melodies on the spot. So with him having a rough idea of what he wanted to do vocally we had Mike play drums on it. Then I rerecorded my guitars, now using electric and acoustic combination, to Hickeys drums. Then Tom added Bass and Tyler a few more guitar parts. Then Tyler cut his vocals. The subject became a very personal matter for Tyler but one we can all understand. When it comes to our personal demons at times we all have to deal with the judgment of “Everyone Surrounding”. It’s easy for Tyler and I to share the vocal and lyric duties as we generally write about a lot of similar things. Subjects we both understand and deal with. Subjects I think a majority of people understand and deal with. Review Fix: How does the success of this group affect Coheed and Cambria? Stever: I think anything a member of Coheed does if it’s good will help the band. It’s a family affair. 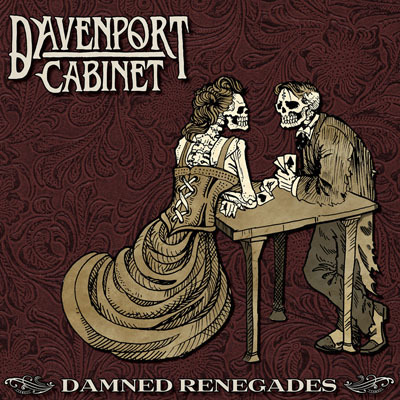 If someone likes Davenport Cabinet and it leads them to Coheed, I am positive they will fall in love with it. It’s the creative source for each member. Our home base. So all things lead back. It’s like leaving a trail full of tasty treats to lure someone in. But in this case it’s music. At least that’s how I like to look at it. Stever: I want it to be remembered for what I know it to be. Music from the heart and soul that kept me sane while awaiting the birth of my son and going through huge changes. I hope that vibe carries over to the listener. And they can find the enjoyment and pleasure they want within the music. Review Fix: What’s next for the group?